What I make is beautiful art that becomes part of your daily life. I saw a potter working when I was five and was certain this was for me. My training began as an apprentice, and finished with an MFA from Cardiff, Wales. The studio/showroom is located in an 1850’s stone house and stable in the heart of Dundas, Ontario. You’ll find my studio line of durable stoneware table/kitchen ware, dinnerware and decorative accessories inspired by the natural beauty of the Dundas Valley. From an everyday bowl to stunning decorative piece, for more than 35 years Scott brings style to any interior. I also create reduced Islamic lustreware, challenging work that I make for my own pleasure. The technique is complex and expensive, the work precious. So far as I know the only pottery working in this field in all of North America. 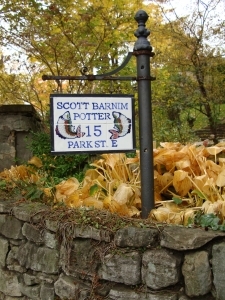 Scott is a founding member of the Beyond the Valley Studio Tour, a diverse group of talented full time professional artists who open there studios for a tour twice a year. To see information about Beyond the Valley, please click on the link below.